ProcureWare by eBid Systems is a modern SaaS application that helps procurement teams manage vendors, conduct sourcing events, and track supplier contracts. With ProcureWare, organizations have the tools they need to drive process efficiency and cost savings throughout the enterprise. Since 1999, eBid Systems has been providing supplier management, sourcing, bidding, and contract management software-as-a-service to clients globally across a range of industries. ProcureWare provides a suite of tools to manage supplier relationships. With ProcureWare, Organizations can centrally manage and control supplier engagements to support improved risk management and sourcing decisions. ProcureWare streamlines the on-boarding process through a customizable supplier self-registration process and monitors whether insurance, certification, and diversity information is up-to-date. Buyers can then invite pre-qualified suppliers to competitive bidding events using pre-defined templates for various RFx types. Once bid responses are received, ProcureWare streamlines the process of bid evaluation and facilitates collaboration of the sourcing team in analyzing and scoring responses. ProcureWare’s contract management capabilities support ongoing management of supplier engagements, including centralized access to contract documents, modifications, and contract milestones. ProcureWare can be configured to the needs of any organization, with customizable fields, reports, scheduled reminders, message templates, user roles and localization into any language and currency. ProcureWare has enabled our city to fully automate the formal solicitation function including vendor registration, management of the procurement solicitation lifecycle including transparent communication with our vendors, vendor award, contract management, etc. The software is intuitive and cloud based allowing 24/7 access from anywhere with an internet connection. I highly recommend ProcureWare.Ease of Use; Cloud Based providing centralized access to Procurement and Vendor Data 24/7; Contract management capabilities; Excellent Customer Support and Quality Control (upgrades are tested thoroughly to reduce any chances of unintended software bugs). Ease of Use; Cloud Based providing centralized access to Procurement and Vendor Data 24/7; Contract management capabilities; Excellent Customer Support and Quality Control (upgrades are tested thoroughly to reduce any chances of unintended software bugs). The EBid team has provided superior support and has not only customized our platform to meet specific needs, but also has provided suggestions and ideas focused on efficiency and cost reduction. I highly recommend eBid Systems to any business considering a move to electronic procurement. Over the past 18 months, we have exceeded all of our goals related to implementation and cost savings. We had a daunting task to find an electronic procurement software package that can be effectively used by hundreds of individuals, spread out over several states, for the procurement of all types of products, services, and constructions projects. Not having a centralized procurement team, the software needed to be intuitive and easy to use, yet powerful enough to support multi-prime, multi-million dollar projects. We did an extensive evaluation of 15 different packages and eBid Systems was the obvious winner as they clearly understand the needs of the end user. EBid Systems has enabled us to efficiently streamline our processes, maintain document and communications management consistency, assure delivery of communications, manage a 4,000 member vendor pool, and generate reports needed to run our business. We had a daunting task to find an electronic procurement software package that can be effectively used by hundreds of individuals, spread out over several states, for the procurement of all types of products, services, and constructions projects. Not having a centralized procurement team, the software needed to be intuitive and easy to use, yet powerful enough to support multi-prime, multi-million dollar projects. We did an extensive evaluation of 15 different packages and eBid Systems was the obvious winner as they clearly understand the needs of the end user. EBid Systems has enabled us to efficiently streamline our processes, maintain document and communications management consistency, assure delivery of communications, manage a 4,000 member vendor pool, and generate reports needed to run our business. •	Procurement teams can quickly access supplier information through ProcureWare's centralized database. Suppliers are responsible to self-register and keep their company information up to date including service categories, experience certifications, licensing, and insurance. •	The internal procurement team has the opportunity to review and approve new vendors in ProcureWare before inviting them to a bid. ProcureWare makes it easy to standardize supplier qualification and create a consistent step-by-step process. •	With ProcureWare’s integrated messaging capability, procurement teams can easily send vendor notifications and distribute bid documents. The system will track delivery and automatically log the communication, creating an auditable trail. •	Procurement teams can create and store ready to use RFI, RFP and RFQ templates in ProcureWare to ensure consistency and alignment with business rules. •	With ProcureWare, procurement teams have a number of options in the way they choose to administer and ultimately award a bid. The system supports team bid scoring, sealed bidding, reverse auctions, automatic bid tabulation, and the comparison of alternative award scenarios. 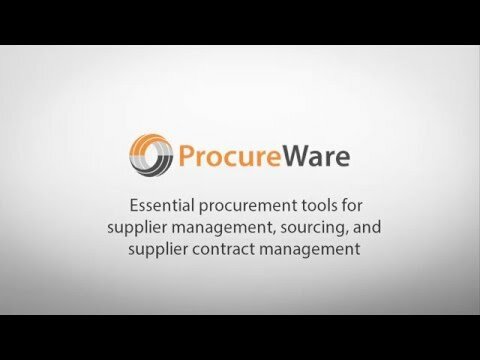 •	ProcureWare allows procurement teams to auto-generate a contract from an awarded bid. These contracts along with their related documents, modifications, and warranties can be accessed and managed through a centralized database. Below are some frequently asked questions for ProcureWare. Q. What type of pricing plans does ProcureWare offer? Q. Who are the typical users of ProcureWare? Q. What languages does ProcureWare support? Q. Does ProcureWare support mobile devices? Q. Does ProcureWare offer an API? No, ProcureWare does not have an API available. Q. What other apps does ProcureWare integrate with? Q. What level of support does ProcureWare offer? Q. Which apps is ProcureWare compared to most often?